A Palestinian, two of whose Scriptural interpretations are preserved in the Midrash: one to Gen. xxvi. 14 (Gen. R. lxiv. 7; compare Sanh. 58b; Yalḳ. on Prov. xii. 11), and the other to Eccl. iv. 1 (Lev. R. xxxii. 8; Eccl. R. ad loc.). The time of Daniel may only be conjectured. 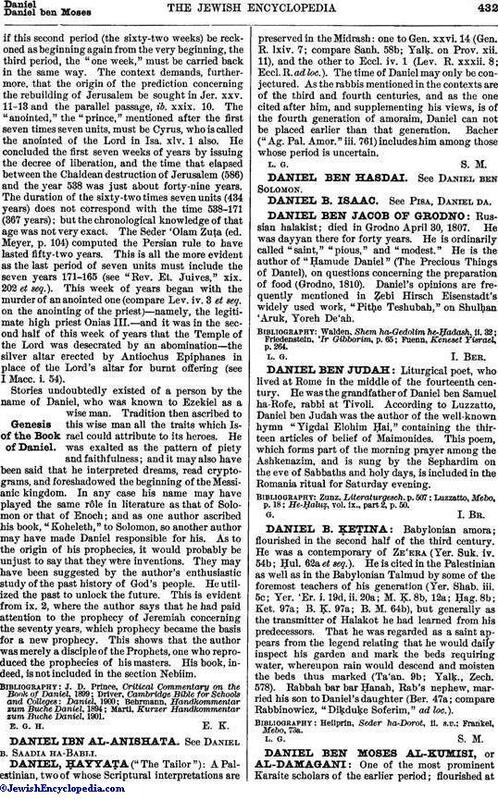 As the rabbis mentioned in the contexts are of the third and fourth centuries, and as the one cited after him, and supplementing his views, is of the fourth generation of amoraim, Daniel can not be placed earlier than that generation. Bacher ("Ag. Pal. Amor." iii. 761) includes him among those whose period is uncertain.